Posted on October 7, 2014 by EllenAllen	in Marketing, Planning to write, Self-publishing and tagged Amazon, BookBaby, guide to self-publishing, How to self-publish, Mary Kole, Preparing to self-publish, Revision Checklist, Self-publishing, writing mistakes. 1. Get a critique of your final draft. If you’re going to spend any money, it should probably be in the editing process (as well as in preparing the cover). Otherwise you run the risk of publishing what agent Mary Kole calls, “just a printout of (your) manuscript bound between two thicker pieces of cardboard, and about as fulfilling as a pile of scratch paper”. If you really cannot afford professional services ask trusted friends and family members to review your book and use websites where you can get feedback on your stories. Wattpad and widbook will help you connect to readers but sites such as youwriteon can offer really in-depth reviews. For the latter, if you review 8 other pieces of work (randomly assigned) you will receive critiques of your own. The best stories on yourwriteon go into a ranking system where the most highly rated are read by literary agents. 2. Get your “platform” ready. If you’re starting at zero you really will need time to find those twitter followers that are desperate to read your daily musings, or to make those all-important facebook friends. It also takes some time, and organisation, to link all your different mediums together. Part ii of this series explains what might constitute a good author platform. 3. Get some beta readers to review your book. Once you’ve got your real final draft (after editing and critiques) put it in the hands of actual readers. Goodreads has lots of groups of people who are willing to critique early work (provided it is actually finished!) and will offer really constructive feedback on your story. How much hand-holding do you want? Do you want a professional to take over all aspects and to be available to answer all those really useful questions that you know nothing about (like whether you want Digital Rights Management – DRM – for your book or information on the price point for your books and the implications that these decisions will have, etc…) The answer will also depend on distribution. Do you want your book available everywhere or just Amazon? 5. Create your cover. Whether you use a professional here or not (and I think it probably pays to use one) make sure the name of your book is clear in the thumbnail. Spend time here; really investigate the look and feel of other book covers. This is what readers will use to decide whether or not they’ll read your book! 6. Preparing your final document will take much longer than expected. In total, it took me two months to proofread, design the cover and check the formatting. Obviously your book will have greater distribution possibilities if it is available in all the three main formats (mobi, pdf and epub) but this will take longer to check as you’ll have to read through all three. Make sure you plan for this length of time in launch schedules. 7. Get your marketing blurbs ready. You’ll need lots of different blurbs for your book – long blurbs, short blurbs, A4 summaries (with plot spoilers and without), one sentence taglines, two sentence loglines, teaser paragraphs – and make sure you also have your cover photo somewhere online in a really high resolution that you can link into different sites (Photobucket will let you do this). If you can’t distill your book into one or two sentences, now is the time to worry. Hone your pitch (this is now the first thing I do before I start a new writing project – deciding what it’s actually about!). I keep all of these marketing items in a word document along with the first three pages of my book on my desktop so it’s easily accessible to cut and paste what I need at a moment’s notice. 8. Sort out your advertising. Are you going to run giveaways, youtube book trailers or pay for ads on sites like goodreads? 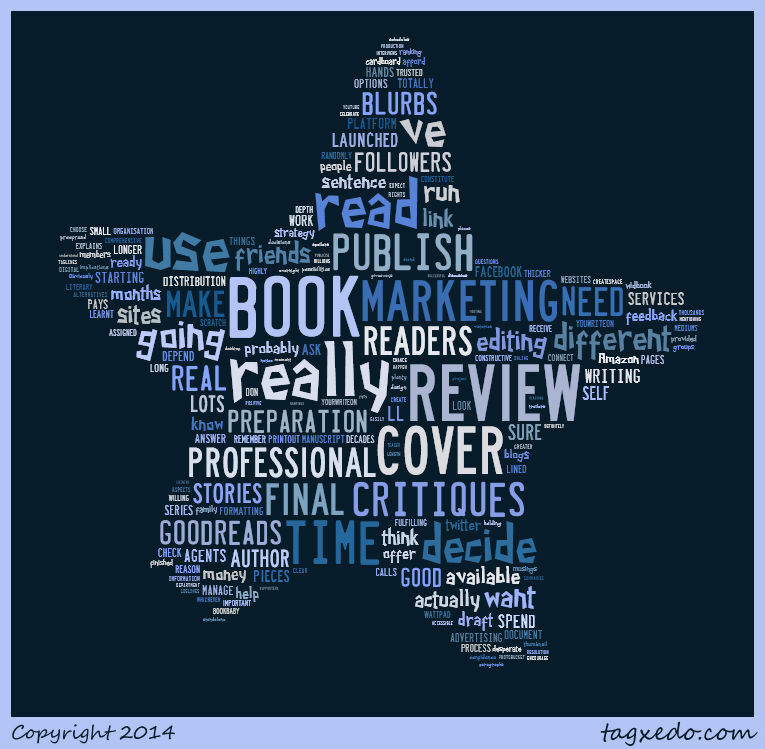 Are you going to try to get some author interviews fixed up? You need to think about this now. Part iii in this series discusses which marketing tools to use and how. 10. Finally, remember to celebrate the small victories. You are your very own, editing, marketing, advertising and production department and you have a very long road ahead of you. It won’t happen overnight, if at all (you only need to trawl through the millions of goodreads authors to understand how few people actually manage to become successful self-publishers) so remember to enjoy the small things: the jump from ten to fifty twitter followers; reaching 100 likes on your book’s facebook page; gaining a real footing on goodreads, where you have met some great friends, supporters and fans. Don’t spam your followers with “all about me” posts but do publicise your good reviews! There is nothing more frustrating than reading a self-published book that has so many errors it is impossible to read. Sadly, this has happened more than once. You’re right! It’s a useful addition; I took it as given that this needs to be done, but you’re right to make it explicit! Thanks!